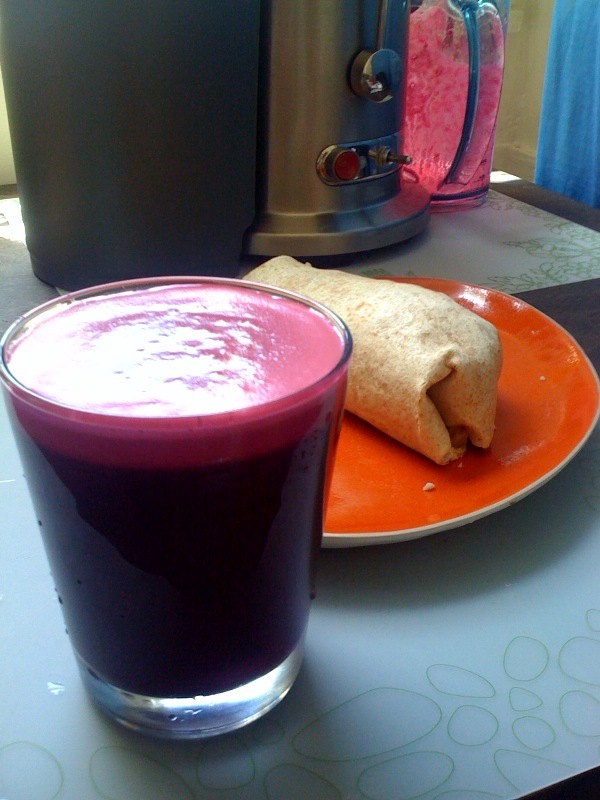 I had a fantastic morning… met RC for a run at Crissy Field, found all kinds of delicious, organic produce at the Civic Center Farmers Market, then made myself a power lunch with freshly juiced fruits and veggies and a mixed bean/brown rice burrito. My lunch kept me going through afternoon practice and I’ve noticed how energetic I feel since I’ve been juicing with my new juicer! After posting yesterday’s swim workout, there was a question about swim drills. I have added a page with a link to a Team in Training video and will continue to work on this page. We had a gorgeous and windy morning for a run. Crissy Field is always windy so we headed in the direction of the wind first. We made it from the beach to underneath the bridge then decided to make our way up the many steps and steep trail to the bridge. We actually ran most of it at an easy pace and were still able to chat on the way back. In the end, we both felt like our legs had gotten a great workout but we weren’t winded. This sort of run- with a friend and not too hard- is the sort that leaves me looking forward to the next one. And right now, that’s my entire goal in the wonderful world of exercise! Find a running buddy and get out there! veggie omega + DHA for cardiovascular support and heart health Your source for fish-free omegas. Kosher certified! According to my Wildflower schedule, Mondays are supposed to be recovery days. Today I felt good and I knew that later in the week there would be less time for training, so I decided to go ahead and do something. I left the house on my bike with clouds promising rain and returned from the pool, still on my bike, which shopping attached to the back, with clouds producing. Now that I’m back home, the sun is trying to come out. My triple brick was bike/shop (at Sportsbasement, of course)/swim. I managed to get the speed limit sign flashing on my descent into the Presidio and push my bike through the mud on my way home, due to construction and lack of signs. The swim in the middle was good, but the pool crowded because I was there during Masters. It is 8 am and I’m somewhere between Santa Fe and Denver. Today will be a rest day for me because I am feeling exhausted and my back is aching. One of the most important aspects of training is listening when my body tells me to stop! •Running shoes – They are almost always on my feet because they take up the most space if packed. •Water bottle (Earthlust, 13oz) – I like to have water with me at all times and hate buying bottled water. I generally end up gulping whatever is in the bottle before security, then refilling it before boarding. Staying hydrated is one of the best ways to maintain good health on dry airplanes. •Barley green (Nikken jade greenzymes travel packs) and Tea bags (jasmine green tea) – The health benefits to both are numerous. I’ve recently added a travel mug to my tea stash so I don’t have to use to-go cups anymore. •Inflatable travel pillow – I stash Earplugs and a tea bag in the case for each flight. Noise cancelling headphones and an eye mask are essential for red-eyes. •Sunglasses, Running hat (or stocking cap), Sunscreen – Even on cloudy days, the rays can damage skin. My polarized shades are necessary to reduce strain so I can focus on all those little black notes come rehearsal time. •YMCA membership card and Combination lock – I love my gym membership and frequently use the “away” privledges. •Workout clothes (and swimsuit) – I pack layerable items of thin, wicking fabric, which are not only small to pack but dry quickly after hand washing. I try to get a sense of the workout conditions before arriving somewhere… outdoor temp, hotel gym facilities or neighborhood, nearby YMCA, etc. •Watch or Armband for iPhone – Sometimes I travel with my heartrate monitor strap but often just the watch. The other option is bringing along my phone for music and GPS. One cool free app I’ve found is MapMyRun. It’s tends to work best in less crowded areas and will show distance, speed and route. This seems like way more than necessary and I don’t consider it “traveling light”. That said, I packed for 10 days with temperatures from 30-70 degrees. It all fit with my music stand, performance gowns and regular clothes in my carry-on suitcase!